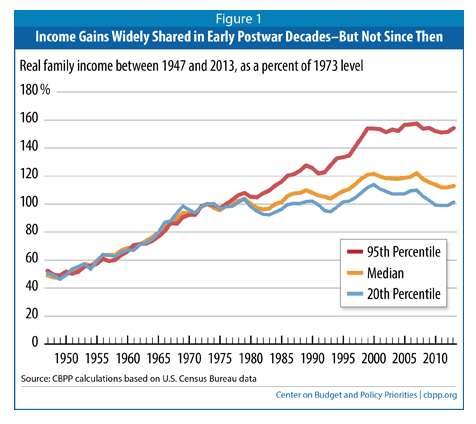 As this chart prepared by the Center on Budget and Policy Priorities shows, until about 1980, the real family income of Americans at all income levels increased at approximately the same rate. It didn’t matter if your family was in the 20th percentile, 95th percentile or anywhere in between, you participated about equally in the growing wealth of the nation. That all changed around 1980 when Reagan took office and the Republicans began their accent to power. Since about 1980, lower and middle income Americans have seen few if any income gains. The country has become richer overall, but the wealthy has gone to the top 5%. The rich got richer, almost every year. Income creation became less fair. Why was that? 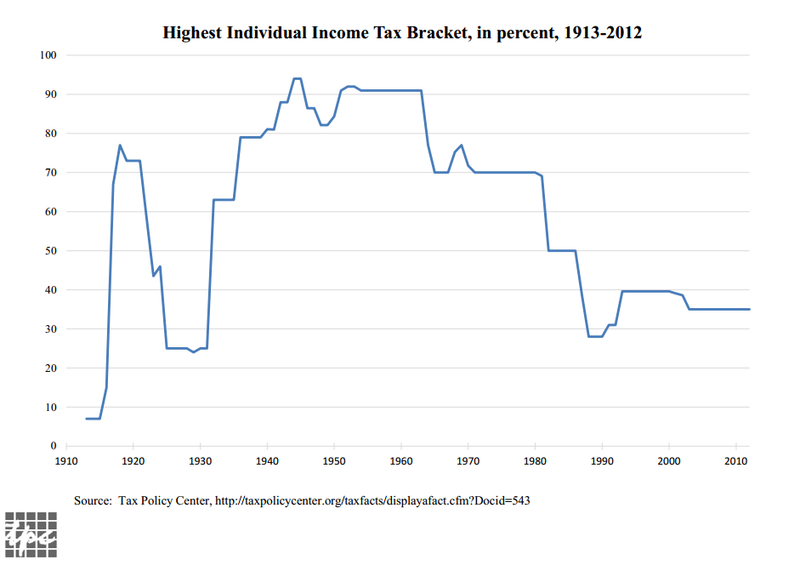 As you can see from the following charts, since the 1950s and particularly since 1980, the highest income tax bracket (the tax rate very rich people pay on their income above a certain level—over about $400,000 in 2014) has been cut dramatically as has the average tax rate that the highest income earners paid. The highest tax rate is now at a level comparable to the late 1920s, just before the Great Depression and New Deal. 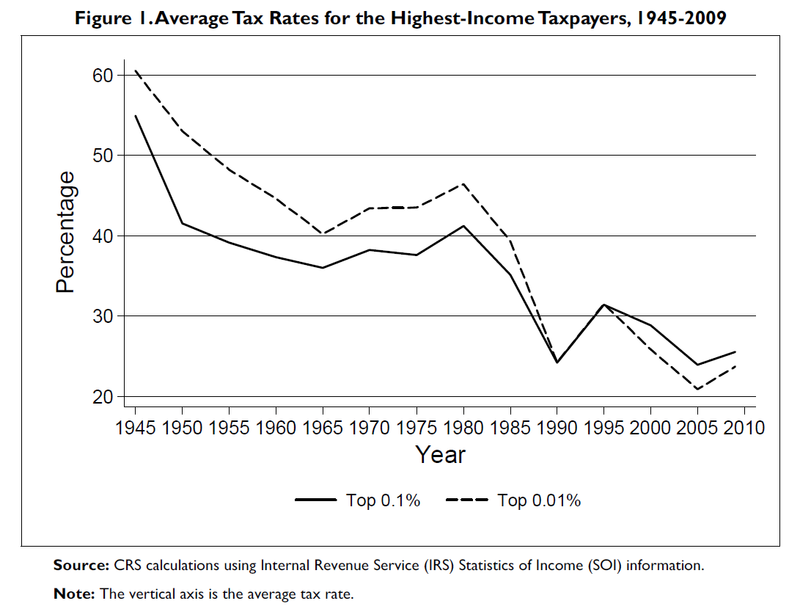 These dramatic cuts in the tax rates the top 10% of Americans pay has made the taxe much less progressive as shown in Chart 3. As a result, the burden of taxation has been shifted to lower and middle income brackets. NOTE: Republicans argue that reducing the tax burden on the rich is the true path to economic growth. They say with less taxes to pay, the rich will create jobs for the rest of us and wealth will come trickling down. The fact is, it never happens. 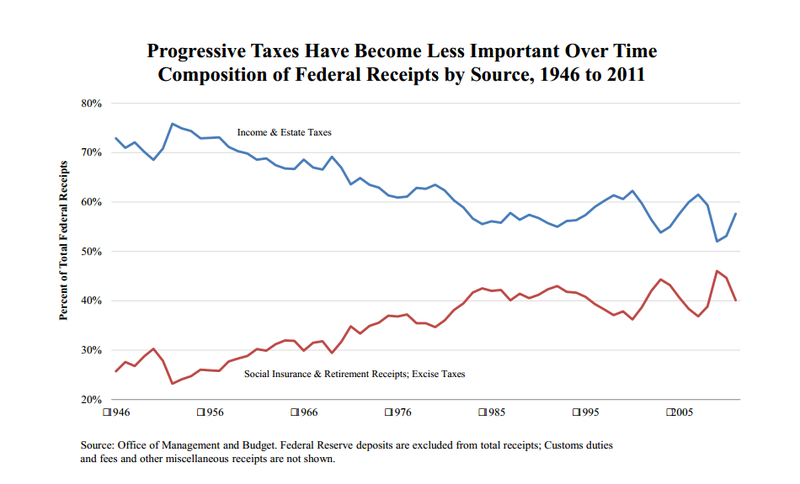 The independent Congressional Research Service analyzed the impact of cuts in the top tax rates on economic growth going back to 1945. It found practically no relation between the top tax rate and economic growth. In fact, real per capita GDP growth was higher in the 40s and 50s when the top rate was 90%. 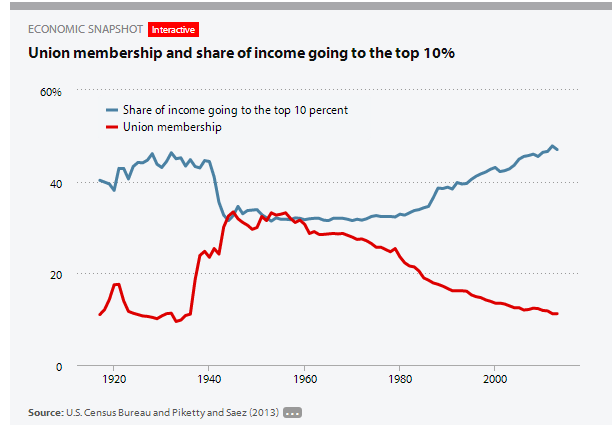 The decline of union membership is a second contributing cause of income inequality as can be seen in Chart #3 from the Economic Policy Institute. Union membership in America peaked in the 1950s and has been in decline since then. The decline has been particularly sharp since 1980, again coinciding with Reagan and the rise of Republicans who have waged an ongoing and largely successful war on unions, first private and now public, by advocating so called “right to work” laws that make it very difficult for unions to operate. Without the ability to organize, the average working American is at the mercy of his/her employer for wage gains and employers are typically very reluctant to share the bounty from productivity growth even when that bounty in no small part from worker sacrifices. In fact, a 2013 Bureau of Labor Statistics report found more than a $3 per hour difference in he average wages of union vs non-union workers. In short, wages for most Americans remain low because they have lost he one vehicle through which they could bargain for higher wages. Without unions, profits from productivity gains flow to the owners and top managers who, thanks to favorable non-progressive tax policies allow the to keep most of the gains as after-tax income. Bottom Line: If we are concerned about income inequality (and we should be) then we need to re-institute a progressive tax system and make it easier, not harder, for Americans to organize and bargain for better wages and benefits. It’s called Income Fairness.